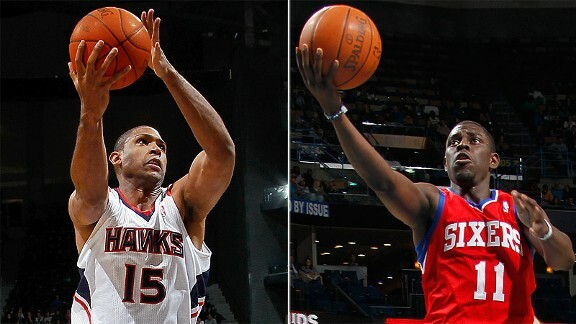 The Hawks and Sixers are pulling off a rare trick -- playing younger players while winning more. You want to win games in the NBA? Want to learn the secrets of champions like the Mavericks? One approach is to get some of the oldest NBA players, and play them a lot. The people at Hoopism just launched a little study they'll be updating throughout the year. They're not just looking at the age of the players on a team's roster, but they're going an intelligent step further and adding an element that looks at how many minutes each player plays. The final measure is the average age not of those in uniform, but of those on the court. The resulting list from this young season finds that the 15 oldest teams are a combined 74-50, while the 15 youngest teams are a measly 49-73. Of course, that raises a chicken-and-egg question. Are good teams good because they're old? Or are good teams more willing to invest in win-now players? Another point, though, is that if teams tend to age well, it's surely a great thing to be young and winning. And amazingly, Hoopism finds that the two teams that lead the league in dispensing minutes to the youngest players on their rosters have been the Hawks and Sixers, who have also been two of the early season's most pleasant surprises. Atlanta has the NBA second-oldest roster. But 23-year-old Jeff Teague is playing the second-most minutes at a position that was once manned by ancient Mike Bibby, while Al Horford and Josh Smith are mainstays. And now seven teams are older, in terms of who's on the court. Meanwhile in Philadelphia Jrue Holiday and Spencer Hawes are playing long minutes, while Elton Brand is the only player over 30 to see much of the court. The Sixers are the NBA's third-youngest team with an average age barely over 25. The Mavericks have the oldest roster and thanks to a shortage of minutes for anybody remotely near the beginning of their careers, play even older. Dallas plays players with an average age north of 32. The second-oldest team, the Celtics, averages just a tad over 30. There is a big range of average ages. Teams' averages range from less than 25 years old (the Kings are youngest) to the Mavericks' mighty 32.31. The rebuilding Cavaliers are older than you might think -- coming in 15th. When people talk about old teams, they talk about the Spurs, Mavericks, Celtics, Lakers and the like. And while the Mavericks, Celtics and Lakers do indeed top the list, the Spurs have managed to get younger players into the rotation, and are only the tenth oldest teams -- a fraction of a year older than the up-and-coming Bulls despite heavy reliance to Tim Duncan. The wonderful Thunder are about the same age as the horrible Wizards. After the Kings, the Timberwolves of Ricky Rubio and Kevin Love are youngest. Blazer fans have long been excited about their team's potential. But don't look now -- Gerald Wallace, Marcus Camby and the crew are already the fifth-oldest team. The Heat have young superstars playing long minutes. But they're surrounded by so many old players that even when Norris Cole is accounted for, they end up the sixth-oldest team in the NBA. Would you believe the Knicks are slightly younger than the Nets? Even though the Nets are rebuilding, the big minutes have been going to veterans Deron Williams, Kris Humphries and Mehmet Okur. You may have noticed that the 4-4 Suns have gone from one of the fastest-paced teams in NBA history to one of the slower teams in the league this season. Possible reason? They're now the fourth-oldest, right behind the Lakers. CORRECTION: The original version of this post included some mistakes -- most notably I said the Bulls had gotten younger, when in fact they are older.